Steelmaking slag is an integral part of the steelmaking process. It is produced during the separation of the liquid steel from impurities in steelmaking furnace and is a non-metallic by-product of steelmaking process. It occurs as a molten liquid melt and is a complex solution of silicates and oxides which solidifies upon cooling. It primarily consists of silicates, alumina silicates, calcium aluminum silicates, iron oxides and crystalline compounds. During steelmaking, slag is produced in the hot metal pretreatment processes (desulphurization, desiliconization, and dephosphorization etc. ), in the primary steelmaking processes (basic oxygen furnace, electric arc furnace, and induction furnace), slag formed during the secondary refining processes (this slag is sometimes called ?secondary refining slag? or ?ladle slag? ), and slag formed in tundish during continuous casting of steel (also known as tundish slag). The slag generated in the basic oxygen furnace (BOF) and electric arc furnace (EAF) is of basic nature while the slag is of acidic nature in induction furnace because of the use of silica ramming mass as the lining material. Since most of the steel produced in the world is by BOF and EAF processes, hence slag from these processes is discussed in this article. 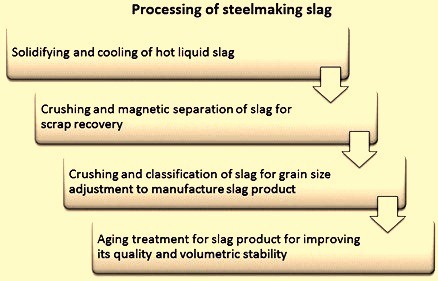 The processing of the steelmaking slag (Fig 1) is normally carried out by (i) solidifying and cooling of the hot liquid slag, (ii) crushing and magnetic separation treatment of the slag to recover the scrap, (iii) crushing and classification of the slag for grain size adjustment to manufacture the slag product, and (iv) aging treatment of the slag product for improving its quality and volumetric stability. These processes are explained below. As steelmaking slag is formed, it is in a molten or red-hot state at temperatures ranging from 1,300 deg C to 1,700 deg C. This slag is immediately subjected to the cooling process upon removal. Usually, this is performed in a cooling yard by air cooling and moderate water sprinkling. However, this method requires a considerable amount of time to cool the hot slag down to a workable temperature and requires a spacious yard. Hence, a number of more efficient cooling processes have been developed. These include the air granulation process, in which a high pressure gas is blown onto the liquid slag to solidify and granulate the slag while it is being cooled, the ?instantaneous slag chill? (ISC) process in which the hot slag is first poured into a steel box for accelerated cooling/solidification and then subjected to water sprinkling and immersion cooling, and the rapid cooling process in which the liquid slag is poured into a special drum and cooled rapidly by sprinkling water over the slag. In addition, another process is being developed in which the liquid slag is poured between twin-rolls and cooled very rapidly. There is the possibility that this process may allow for effective control of slag solidification and provide for the recovery of a large portion of the heat loss in the cooling process. Steelmaking slag contains around 10 % of scrap which comes from the refining process or from some of the processing vessel (e.g. BOF, EAF, steel teeming ladle, or tundish). It is advantageous to separate this scrap from the slag for the purpose of recycling the recovered scrap in the primary steelmaking process for making the slag free from scrap for its various applications. Hence, after cooling, the slag is crushed and the scrap is recovered by magnetic separation. Further in order to increase the scrap recovery ratio and to improve the quality of scrap recovered, the crushing and magnetic separation process is repeated several times. The separated slag produced is further processed by the process of crushing and classification. 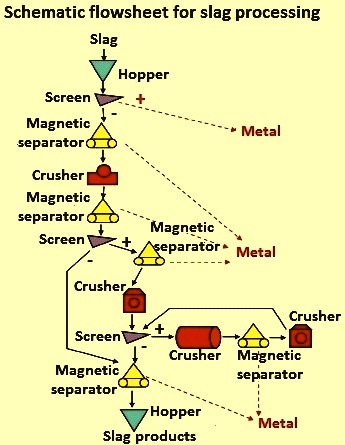 In this process (Fig 2) crushers, magnetic separators, and screens are used for simultaneous recovery of scrap and adjustment of slag grain size. During the steelmaking processes the added flux for the refining of the steel forms a component of the steelmaking slag. It is of particular importance that CaO and MgO contained in the flux remain partly inactive in in the slag or crystallize while the slag is solidified and cooled. These inactive materials, referred to as free CaO and free MgO, react with water, and, in the process, their volume nearly doubles through hydration. As a measure to prevent this, the steelmaking slag is subjected to the aging treatment process, whereby the following hydration reaction is completed by the time the slag is put to use. There are two methods of aging treatment. The first is the normal aging treatment, in which the hydration reaction is allowed to take place by nature in the yard, while the second process consists of accelerated aging treatment in which the hydration reaction is induced to complete in a shorter period of time. The accelerated aging treatment processes include ?steam aging treatment? which uses high-temperature steam, ?hot water aging treatment? in which the slag is immersed in hot water, and ?high pressure aging treatment? which causes the slag to react with steam in a vessel under high pressure (6 kg/sq cm to 10 kg/sq cm). In recent years, steam aging treatment or high pressure aging treatment is often applied to steelmaking slag to ensure moderate, uniform expansion of the slag, especially when the slag is to be used, for example, for road base course material, where expansion can become a major problem. Knowledge of the chemical, mineralogical, and morphological properties of steelmaking slag is necessary since their cementitious and mechanical properties play a vital role in its utilization. For example, the frictional property of steelmaking slag is influenced by its morphology and mineralogy. Similarly, the volumetric stability of the slag is a function of its chemistry and mineralogy. Steelmaking slag is mainly calcium alumino silicate. This compound contains elements like sulphur, selenium, carbon, cadmium, lead, copper, and mercury. Many of the residuals are encased within a glassy matrix. The matrix is soluble and releases calcium and manganese oxides, which can increase the pH of the dissolving fluid to a level of 10 or 11. As slag is a coarse glass, it maintains high permeability (0.045 centimetres per second) regardless of how much water has passed through it. The permeability of the slag is reduced when it is compacted or grounded into smaller particles. The density of steelmaking slag lies between 3.2 grams per cubic centimeters (g/cc) to 3.6 g/cc. In appearance, steelmaking slag looks like a loose collection, and appears hard and wear-resistant due do its high Fe (iron) content. Its bulk density is in the range of 1.6 tons per cubic metres (t/cc) to1.9 t/cc. The grindability index of steelmaking slag is 0.7, in contrast with the value of 0.96 and 1.0 for blast furnace slag and standard sand respectively. Steelmaking slag aggregates are highly angular in shape and have rough surface texture. They have moderate water absorption (less than 3 %). The steelmaking slag is composed mainly of calcium oxide (CaO) and silica (SiO2). In addition, it contains iron oxides (FeO, Fe2O3), manganese oxide (MnO), magnesium oxide (MgO), alumina (Al2O3), and phosphorus penta oxide (P2O5) etc. The chemical composition of steelmaking slag varies with the furnace type, steel grades and pretreatment method. Tab 1 summarizes the chemical composition of BOF slag and EAF slag. Typical particle size distribution and variation in Fe and P content of the slag fractions is given in Tab 2. The main mineral phases contained in steelmaking slag are dicalcium silicate (C2S), tricalcium silicate (C3S), RO phase (CaO-FeO-MnO-MgO solid solution), tetra-calcium alumino-ferrite (C4AF), olivine [(Mg, Fe)2SiO4], merwinite [Ca3Mg(SiO4)2], and free CaO. The utilization of the steelmaking slag is closely related to its chemical and physical characteristics. Tab 3 lists the relationship between the characteristics and application areas of steelmaking slag. Processed steelmaking slag has favourable mechanical properties for aggregate use, including good abrasion resistance, good soundness characteristics, and high bearing strength. Some typical mechanical properties of steelmaking slag are as follows. Due to the high heat capacity, steelmaking slag aggregates have been observed to retain heat considerably longer than conventional natural aggregates. The heat retention characteristics of steelmaking slag aggregates can be advantageous in hot mix asphalt repair work. Steelmaking slag has several applications. These are described below. Scrap steel reclamation – Steelmaking slag contains around 10 % scrap steel, which can be reclaimed through crushing, sorting, magnetic separation and screening process. This steel can be recycled. Usage in sinter mix -Steelmaking slag contains high percentage of CaO (mostly above 50 %). It can be used as fluxing agent in the iron ore sintering process where it replaces lime and limestone. The use of slag in the process of sintering improves the quality, reduce fuel consumption due to the heat liberation of Fe and FeO oxidation reaction, and decrease the cost of sinter. Usage in hot metal dephosphorization – Nippon Steel Corporation (NSC) has developed the MURC (Multi-Refining Converter) process, in which dephosphorization and decarbonization are conducted in the same converter. In this process, around 50 % of decarbonization slag is retained in the converter after the decarbonization process and hot recycled as dephosphorization and desiliconization slag for the next heat, resulting in increased dephosphorization efficiency and decreased CaO consumption. Usage in road and hydraulic construction – Steelmaking slag can be processed to aggregates of high quality comparable with those of natural aggregates because of its high strength and durability. The high bulk density, the high level of strength and abrasion as well as the rough texture of steelmaking slag makes it a suitable as a construction material for hydraulic engineering purposes. The artificial reefs for seaweed/coral breeding have been made using carbonated steelmaking slag. The artificial reefs show a high stability in seawater due to the fact that it consists of CaCO3, like shells and coral, and they act as great breeding habitats for seaweeds and coral. Also, based on high level of strength, high binder adhesion as well as high frictional and abrasion resistance, steelmaking slag can be used as an aggregate not only in surface layers of the pavement but also in unbound bases and sub-bases, especially in asphaltic surface layers. Further, steelmaking slag used as a coarse aggregate improves the mechanical properties of asphalt mixtures. Moreover, volume resistivity values of steelmaking slag shows that the electrical conductivity of the steelmaking slag asphalt mixtures are better than that of limestone asphalt mixtures. The use of steelmaking slag can enhance Marshall Stability, resilient modulus, tensile strength, resistance to moisture damage and resistance to permanent deformation of CIR (Cold In Place Recycling) mixes. In contact with water, free CaO and MgO in steelmaking slag react to hydroxides. Depending on the rate of free CaO and/or free MgO this reaction causes a volume increase of the slag mostly combined with a disintegration of the slag pieces and a loss of strength. Hence, the volume stability is a key criterion for using steelmaking slags as a construction material. Immersion expansion ratio is used to evaluate the volume stability of steelmaking slag in some countries while in some other countries steam test is taken to measure that of steelmaking slag used for road construction and boiling test for hydraulic construction. In some countries experience has found that steelmaking slags with a free CaO content upto 7 % may be used in unbound layers and upto 4 % in asphaltic layers. Usage in the production of cement and concrete – The presence of C3S, C2S and C4AF endorse steelmaking slag cementitious properties. It is generally accepted that the cementitious properties of steelmaking slag increases with its basicity. Hence, steelmaking slag ground into fine powder can be used as cement additives and concrete admixtures. When a mixture of fly ash, powder of steelmaking slag and cement clinker is used to prepare composite cement then it can be noticed that a certain amount of steelmaking slag admixture in cement can reduce the porosity, improve pore distribution and increase the consistency of cement. The fineness of slag is also an important factor influencing the activity, and the potential cementitious property of slag fines significantly increases with their fineness. Steelmaking slag can also be used as an aggregate for high-strength and refractory concrete. The compressive strength of concrete using steelmaking slag as fine aggregates is around 1.1 to 1.3 times of common concrete. Further, steelmaking slag concrete shows similar fire resistance to the river aggregate mixture up to 400 deg C, and much improved fire resistance at high-temperature ranges. Usage in other construction materials – Steelmaking slag can be used in preparing glass ceramics. It is a potential material for ceramic production. Also, a suitable addition of steelmaking slag can reduce the firing temperature needed for clay bricks. Steelmaking slag can also be used to produce coloured paving bricks and tiles. Uses in for materials of waste water treatment – Steelmaking slag presents porous structure and large surface area. In addition, it is easy to separate from water due to its high density. Hence, the application of steelmaking slag in industrial waste water treatment has received intensive attention in recent years. The treatment of mercury containing sea water with steelmaking slag shows the high adsorption capacity of steelmaking slag for mercury. Steelmaking slag can be used as a low-cost adsorbent for arsenic in aqueous system, showing around 95 % to 100 % removal efficiency near initial pH value of 2. The removal mechanism includes the co-precipitation and adsorption of CaCO3. In case of the removal of copper using steelmaking slag, the major mechanisms are adsorption and precipitation. In addition, steelmaking slag as a separated adsorbent can be used to remove aqueous ammonium nitrogen, phosphorous, and phenol. The combined use of steelmaking slag and hydrogen peroxide (H2O2) can decompose organic pollutions due to the ferrous ion produced from FeO in steelmaking slag reacting with H2O2 to form Fenton’s reagent which has strong oxidation. Steelmaking slag can also be used as raw material for coagulant preparation. Uses in flue gas desulphurization and CO2 capture – The method of flue gas desulphurization includes wet process, dry process and semi-dry process, among which wet limestone/lime method is most widely used. Steelmaking slag can be used for desulphurization due to its high CaO, especially free CaO content. A study on wet flue gas desulphurization with steelmaking slag powder has shown that by a reasonable design and suitable operation, the steelmaking slag used in wet desulfurization rate can reach more than 60 %. However, this technology is still in the laboratory research stage. CO2 is one of the primary green-house gases, which gives great contribution to the climate change. Hence, carbon capture and storage (CCS) research has been the focus of CO2 reduce technology. Among current popular CO2 sequestration routes, the mineral CO2 sequestration is regarded as a potential important technology due to its benefits such as environmentally caring, permanent trapping CO2 in form of carbonate, and without the need of post-storage surveillance for CO2 leakage. In mineral carbonation, CO2 gas is stored by promoting magnesium or calcium oxides in silicate minerals to react with carbon dioxide and form carbonates. Steelmaking slag contains a large amount of CaO so it is possible to store CO2 in carbonates forms using steelmaking slag slurry with mild conditions of temperature and CO2 pressure. Several studies have been made for the technological condition of CO2 sequestration with steelmaking slag slurry, including reaction time, liquid-to-solid ratio (L/S), temperature, CO2 pressure, and initial pH. In one of the study, it has been shown that the maximum CO2 capture capacity can reach to 211 kg of CO2/ton steelmaking slag with consideration of the contribution of Mg(HCO3)2 in capturing CO2 and the precipitate obtained under optimized carbonation condition has been rich in CaCO3 with composition percentage reaching upto 96 ± 2 %. Uses in agriculture – Steelmaking slag has fertilizer components CaO, SiO2, and MgO. In addition to these three components, it also contains components such as FeO, MnO, and P2O5, so it has been used for a broad range of agricultural purposes. Its alkaline property neutralizes soil acidity. In some of the countries, steelmaking slag is used to produce siliceous fertilizer, phosphorus fertilizer and micronutrient fertilizer.